Habitat: Thyme is native to Europe, including western Mediterranean region and southern Italy. Description: Thyme is a perennial subshrub, growing 15 to 30 centimeters high. It has woody, branched stems and very small, opposite leaves, hairy on their underside, linear to oval in shape. They have a grey-green color. During spring, small lilacs to purple flowers appear, arranged in dense whorls. Useful components: Volatile oil (Thymol), caffeic and rosmarinic acid, tannins, gum, flavonoids, triterpenoid saponins. Medicinal use: Thyme has been considered to be antiseptic, antimicrobial, antispasmodic, astringent, anthelmintic, antitussive, carminative, disinfectant, expectorant and tonic. Thyme is very beneficial in cases of various intestinal infections and infestations, like hookworms, ascarids, gram-positive and gram-negative bacteria, fungi and yeasts including Candida albicans. Its active constituent, thymol, is efficient against salmonella and staphylococcus bacteria. Thyme can also improve liver function, and act as an appetite stimulant. It can be employed in treatment of bronchial, pulmonary and urinary infections. 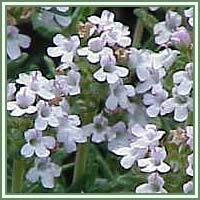 Used as a mouthwash, Thyme is useful in treatment of laryngitis and tonsillitis. 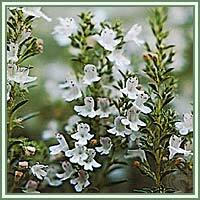 Safety: Thyme is an uterine stimulant, and should be avoided during pregnancy. Excessive internal use can over-stimulate the thyroid gland. Some herbs could react with certain medication. Therefore it is advisable to contact your doctor/herbalist before consumption of any herb.